The season for Nantucket Bay Scallops is coming to an end during the month of March. As you will not see these little delicacies again in your local fish market until November, I recommend a dinner starring the sweet scallops from Massachusetts’ Nantucket Island. 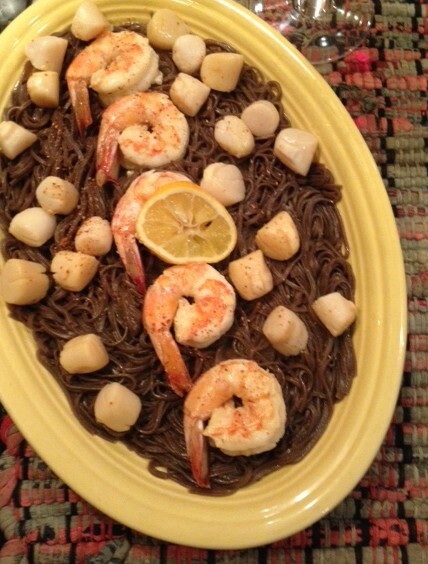 This recipe is for sautéed Nantucket Bay Scallops and shrimp over buckwheat noodles. First, prepare the Oriental style buckwheat noodles according to the package instructions, boiling them for 5 minutes and then running cold water into the pot to prevent them from sticking together. While the noodles are cooking, heat a nonstick pan over medium heat and add several tablespoons of butter. Allow the butter to foam, and tilt the pan around so that the butter coats the bottom. Place the shrimp in the pan, cooking for about two minutes per side until the shrimp become opaque. Remove the shrimp from the pan and add more butter. Place the scallops in the pan with space in between them so that they caramelize. These tiny scallops cook very quickly – only two minutes at most! To plate, scoop the noodles into a serving dish and mix with sesame oil and soy sauce to taste. Top with the shrimp and scallops and season with freshly squeezed lemon juice, ground pepper and sea salt. So long, Nantucket Bays, until next fall! 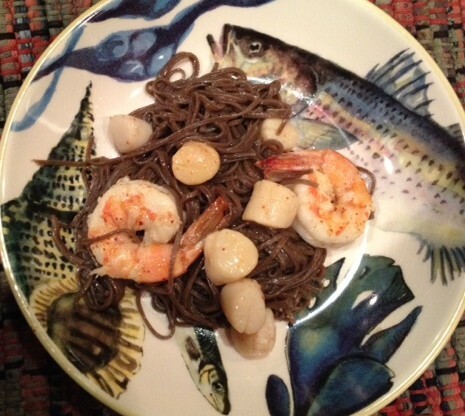 This entry was posted in Uncategorized and tagged Buckwheat noodles, Food, Nantucket Bay, Recipe, Scallops, Seafood, Shrimp, Soba. Bookmark the permalink.